On Nov. 4, the country witnessed history as President-elect Barack Obama won the race for the Oval Office. On Jan. 20, 2009, an estimated 4 million people will flood Capitol Hill to watch Obama take the oath of office as the 44th president of the United States. It’s a no-brainer that a large number of people want to attend this ceremony, but how are they planning to get there and what should they expect? It’s important to know that tickets for Obama’s presidential swearing-in ceremony are not sold. This hasn’t prevented ticket-scalpers from trying to sell them for upwards of $20,000. A limited number of tickets are available free of charge only through congressional representatives and senators of the 111th Congress. In the past, Washington, D.C., has housed a maximum 1.2 million people. Obama’s overwhelming win in the polls has proven to bring in record-breaking numbers of participation. Finding hotel accommodations is difficult, as many of the 95,000 hotel rooms in the Washington, D.C., metropolitan area, are filling up fast. Rooms are even being booked in Baltimore. Students taking BoltBus or Megabus to get to the inauguration should be aware that neither buses run directly from Philadelphia to Washington, D.C. BoltBus has a route from Philadelphia to New York and another that travels from New York directly to Washington, D.C.
There’s still the Greyhound bus. Depending on the time of travel, tickets range from $25 to $30. It’s still too early to tell if buses will sell out, so it’s recommended to buy tickets now. “We’ve just been buried with calls since the election,” Dreyer said. “Prior to the election, we were able to find hotel space for most callers. Since then, it’s been another story. Luckily, the Metrorail is planning ahead and preparing for the large influx of people coming into the city. It will provide free parking at all of its facilities, which house 59,000 parking spaces. The Metrorail will operate its rush hour service for 15 hours, running from 4 a.m. to 7 p.m. The inauguration committee, which just formed a couple weeks ago, announced gates will be opening at 9 a.m. A musical prelude begins at 10 a.m. Attendees are encouraged to arrive early because of security screening. 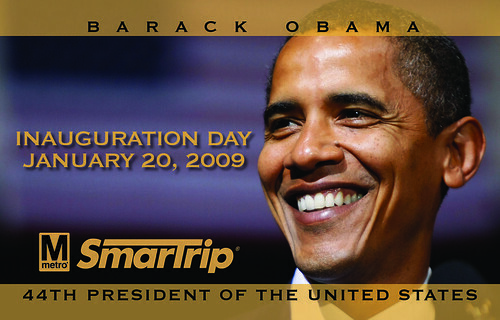 The Metrorail will sell commemorative farecards and SmarTrip cards with Obama’s image printed on them. They’re bound to be a collector’s item and a proud piece of history to hold onto. Farecards and SmarTrip cards become available in December and January, respectively. Buying a One Day Pass for the Metrorail is recommended because it only costs $7.80 and allows unlimited travel. Riders with the pass can avoid long lines at ticket vending machines. Amtrak is another viable option. However, be sure to plan early. Amtrak fares are expensive and are likely to sell out fast, but with careful planning and some know-how, it’s possible to keep transportation costs at no more than $100. Amtrak offers discounts on fares for Student Advantage card holders. Trains entering in and out of the city are becoming nearly impossible to book as Inauguration Day nears closer. Tiffany Yoon can be reached at tiffany.yoon@temple.edu.